BEVERLY HILLS (May 10, 2013) -- The Beverly Hills Historical Society invites all with memories of Beverly Hills to be a part of Beverly Hills history by contributing stories, home movies and videos, and personal memorabilia of the City’s history to be preserved digitally in its official video project in commemoration of the 100th anniversary of the incorporation of the City of Beverly Hills. The project, “Beverly Hills: 100 Years, 100 Stories,” launches during the Spring Beverly Hills artSHOW, May 18 and 19, 2013, at the Society’s table at Beverly Drive and Park Way (under the giant tree) in Beverly Gardens Park. Potential contributors can register to be interviewed during the weekend event. The Society seeks to create an oral and visual history of the City from the people who lived it. This ongoing series will tell the story of Beverly Hills through eyewitness interviews, memorabilia, vintage photographs, newsreels, and home movies and videos. 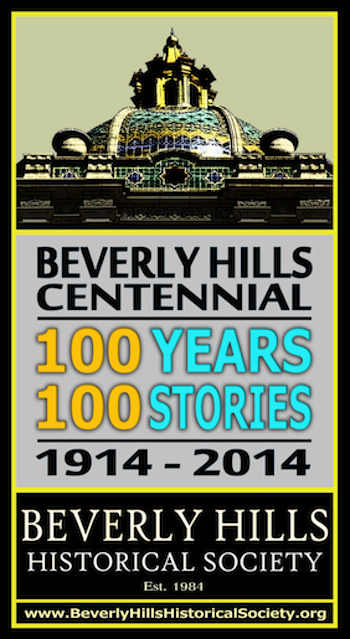 E-mail: 100stories@beverlyhillshistoricalsociety.org or Telephone: (213) 792-BHHS or (213) 792-2447.